For panel and signal decoder, LED drivers are used. These LED drivers get there power (5 volt) from the serial cable connecting them. Long cables, many connectors, or power hungry LEDs, can make the voltage to drop on the cable. If the voltage drops to low, this can be seen as some LEDs will flicker or some LEDs will not work at all. 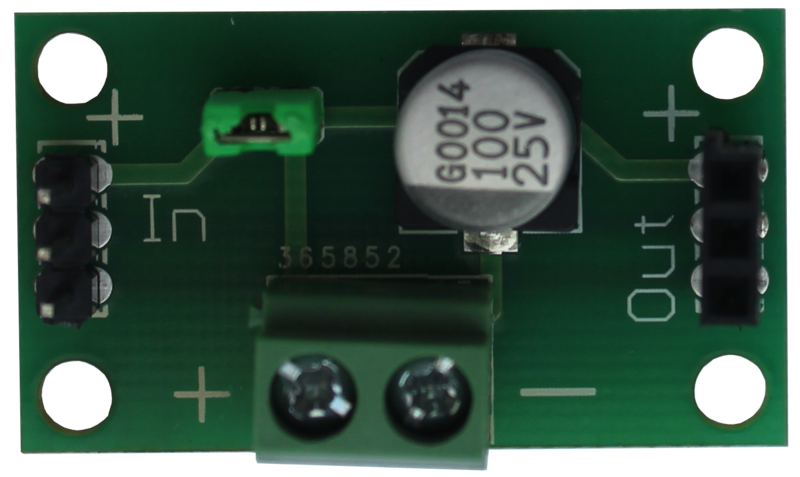 This card can be used to feed the serial cable on more places and so keep the voltage on a acceptable level. If problems are visible in the end at the serial cable, this card can be placed at the end. In many cases it is enough to add the card without connecting any power, as an onboard capacitance will stabilize power. I the cases where more power is needed, 5 volt is connected to the terminal on the cart. Size of the card is 35*20mm.